Well I know the date for springtime has come and gone, but winter weather has not. We’ve had lots of storms the last couple of weeks and this upcoming month I’m trying to increase my paddling days to 3x per week to get ready for the “real training.” We’ve had another storm today but what’s even worse, several days of high winds are predicted. I went out yesterday after work in 15k winds again and got 6+ miles in after work. I had a headwind all the way back to the marina. Normally I’d paddle again Thurs. but 25k winds are forecast with gusts even higher. There’s been small craft advisories all week. While reading everyone’s blogs, I see “winter weather” is visiting lots of people around the world. 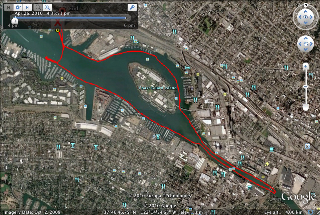 Anyways, I paddled out of Estuary Park in Oakland yesterday and south in the harbor along Alameda Island. I did this same route a couple of weeks ago. Still shared the water with the sculling teams, in addition to some outrigger canoes, and a couple of tugboats and a barge yesterday. Also saw a lonely seal who let me get within 10 feet before he dove deep. The harbor canal continues south to San Leandro Bay and as you round the southern tip of Alameda Island you can turn north and go along the west side of the island (open bay side). I’ve been told it’s 12 miles all the way around. Soon I hope to paddle to San Leandro Bay and get to the marina about midway on the west side of the island. We just have to get rid of this wind! Here’s my route on Monday. This entry was posted on April 27, 2010 by DummyDiva. It was filed under Uncategorized and was tagged with Alameda Island, kayaking, outdoors, paddling, training.